We just celebrated Chanukah a few months ago. Believers who I talk with always ask me about Chanukah. Chanukah was just observed in many homes on December 3-9, 2018 which is on the Hebrew calendar Kislev 25- Tevet 2, 5779. 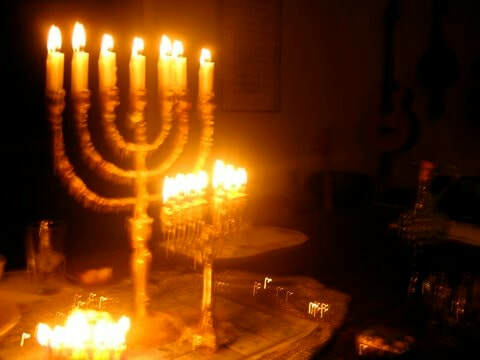 The Chanukkiah technically has 8 lights to memorialize the eight days of the oil burning to give time for more oil to be made holy. The ninth is known as the servant light and is used to light the other lights. In scripture we can find patterns of 8. One of the meanings is that it signifies a new beginning. A new beginning is like a rededication, which is the meaning of the word Chanukah and also is sometimes called the Feast of Dedication. As we look at the Feast of Chanukah and then relate it to our lives in Messiah, it gives us an opportunity to reflect on our faith. The meaning of Chanukah is the rededication of the temple, but we also know our body is a spiritual temple (1 Corinthians 3: 16). Just like the temple needed rededication, we also could use the inspiration of Chanukah to have a time of renewal to G-d.
As we observe these traditions, I search for meaningful experiences to bring into our lives, so we can grow into what G-d has purposed for us. My husband and I decided on a bible study this Chanukah. When we go to the scriptures we can always find help to bring spiritual meaning into our lives and inspire us to be renewed in our faith in Messiah. The bible study is not connected with any traditional Chanukah observance. My husband and I just wanted a time to gather around the candles and discuss the scripture. We involved whoever showed up to visit and any children in the house. In John 10, we read that Yeshua (Jesus) was at the Feast of Dedication. We read this chapter on the first night so everyone is aware that he attended the feast and to hear the proclamation that HE and the Father are one. We also read the Brit Hadashah (New Testament) book of 2 Peter 1: 1-9 that has a list of 8 interesting growth steps. These are Faith, Virtue, Knowledge, Self-Control, Patient endurance, Godliness, Brotherly love, and then Charity or Love for all mankind. The eight steps worked out well as we applied them to the Chanukkiah because of the eight candles. 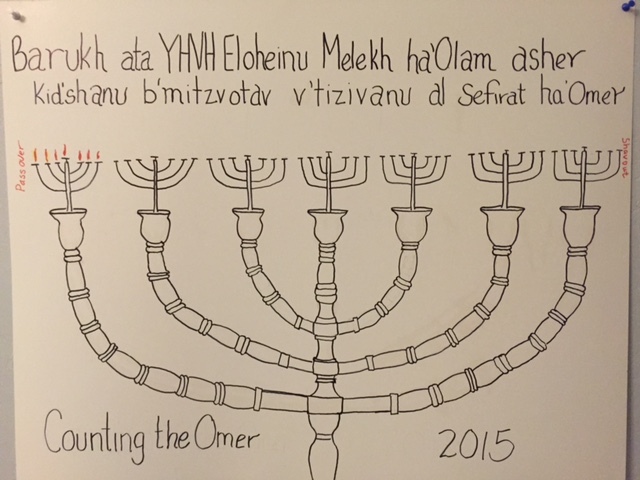 We made a little handwritten poster to go with the Chanukkiah to display the 8 steps from the book of 2 Peter. As we compare the 8 lights to the 8 growth steps in 2 Peter one for each night went very well. However, the Chanukkiah it has nine lights. What do we do with the ninth candle that is separate or higher than the rest, and is known as the servant light (Hamash)? The servant candle when lit brings light into the home and can be shown as a representation of Jesus bringing light into the believer’s life. The servant candle represents our Messiah and He is the light that helps to light those 8 steps from 2 Peter. If we do not have his light in us, we cannot understand His Faith, Virtue, Knowledge, Self-Control, Patient endurance, Godliness, Brotherly love, and then Charity or Love for all mankind. The lighting of the Chanukkiah went like this: On the first night we light the servant candle (Messiah in us) and the first candle (Faith). Our first night’s discussion included the faith that brings salvation and about how our Messiah, Yeshua (Jesus) brings this salvation. This was an excellent time to share our testimonies of how we experienced salvation and our experiences with our faith. Each following night we add another step and discussed how one lead to another such as on the 2nd night, we talked about Virtue and how Faith leads to Virtue. We continued on with the 3rd night, Knowledge, the 4th night, Self-control, the 5th night, Patient Endurance, the 6th night, Godliness, the 7th night, Brotherly love, and on the 8th night, love for all mankind also known as Charity. On the 8th night all the candles are lit and we conclude the feast. and snacking on treats. It was relaxed and informal. The observation of Chanukah was a very fulfilling experience this year. Next year Lord willing, we may repeat or look at the 9 gifts of the spirit! I want to say thank you to everyone who has stopped by, sent me a message, or enjoyed the things that I have made here on this little website. It means so much to me. It makes my heart so very glad that we can share and enjoy the message that Yah has given us. You may have noticed, however, that we've gone a little quiet! At this time, I am currently unable to run this website. Due to life and the responsibilities that it requires. I will be back! This website is going to be under construction for new content. (Exciting!!) I want to say thank you to everyone who has supported me and RTRD. The content currently available will still be up for those who wish to read and meditate on the word. Thank you for your patience. May Yah bless you and keep you. I read an interesting article this week that truly affected my prayer life. I thank Hashem for helping me to find this information. It came about because I have had this interest in understanding the Jewish prayers and prayer times. I have been struggling with the daily prayers, because I just did not want to read words on a page. In my morning prayer time for the last few months I have enjoyed praying the Lord's Prayer. When praying the Lord's Prayer I have meditated as I recited each part to extract meaning and relevance to my life. I find when I pray scripture like this it opens up greater meaning to my life and his word working in my life. Yeshua makes a statement about this prayer in that we are to pray like this. Like what ? Then he quotes what is now known as the Lord's Prayer. Luke 11:1-4 KJV - And it came to pass, that, as he was praying in a certain place, when he ceased, one of his disciples said unto him, Lord, teach us to pray, as John also taught his disciples. 2 And he said unto them, When ye pray, say, Our Father which art in heaven, Hallowed be thy name. Thy kingdom come. Thy will be done, as in heaven, so in earth. 3 Give us day by day our daily bread. 4 And forgive us our sins; for we also forgive every one that is indebted to us. And lead us not into temptation; but deliver us from evil. The author relates the Amidah to the Lord's prayer and that quickened in my spirit. The relationship of the words is amazing. I recommend reading the article and his version of the Amidah prayer. The author breaks up the Amidah into sections and then gives each section a title. So as you pray through the prayer you can pause and add in things. Like under the section for healing you can put in those names of ones who need healing. Under the section for repentance you can search your heart. I really had a break through with this and I wanted to share. Bivin, David. The Amidah Prayer. The Christian Broadcast Network, 2016. Web. 6 June 2016. Teach those who are rich in this world not to be proud and not to trust in their money, which is so unreliable. Their trust should be in God, who richly gives us all we need for our enjoyment. 18 Tell them to use their money to do good. They should be rich in good works and generous to those in need, always being ready to share with others. 19 By doing this they will be storing up their treasure as a good foundation for the future so that they may experience true life. Charity is a very important aspect of living the Torah lifestyle. We should seek Yahweh in prayer as our role in giving and doing charitable works. We can all do a part. Recently, Yah has been dealing with my husband and me regarding visiting those whom are homebound or elderly. It is a good thing to pursue helping. In the book of Isaiah chapter 58 it speaks of how our well being is connected to helping others. Studies have shown how helping others extends our life and can heal us of depression and other ailments. Read below the scripture and see a blog I wrote on the trees of life regarding charitable works. Also you can view the charity link in the web site for more information. I hope you will be inspired to help. This verse jumped out at me during my daily read. This is why I enjoy my habit of reading a little each day. I use the one year bible which is both in print and on line. You can check out the web site as this is one of the branches of the tree that is rooted deep. Most days this happens when I read His word, it is like He is speaking with me. 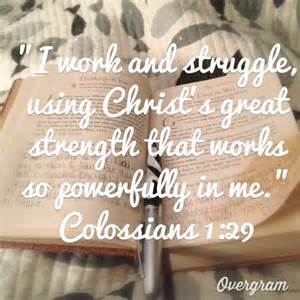 This is an excellent scripture to meditate on today and let Messiah's power work through you. Friday, the 10th of April, 2015 The Hebrew Date is the 21st of Nisan, 5775 - Counting the OMER!! You can use a calendar or any other kind of counting ( There are many ways and methods) to remind you of these special days leading up to Shavout. The children can really have fun with this so be sure and bring the family together to count. 1..2..3..4..5..6. six days of the omer. These are the days Yeshua walked on the Earth after his resurrection! We have just finished the feast of Tabernacles. Tabernacles was a wonderful time of coming close to each other in our camping site. As our family grows close camping together so also we grow close to our brothers and sister in faith. This year we had local teachers who taught on healing the land and healing ourselves. This year I spoke on herbal nutrition. I will be sharing some of the information here as a follow up to those not able to hear the lesson in person. Today is preparation day. So set your table with some bread, wine and some candles. Sing and Praise our wonderful Creator, YHVH who gives us Shabbath as gift. The promise of rest and sharing with Him. A wise woman builds her home,but a foolish woman tears it down with her own hands. The scripture above really spoke to me this morning when I was doing my morning reading. As manager of the family and home we sometimes forget how important our role is to keeping order and peace in the home. We need to be builders by making our homes a place to be. When we keep our nest clean and well stocked our family will flourish. We will also reap the benefit of a blessed life where we can pursue Torah, good deeds, prayer and respect. We should not beat ourselves up over this, but just by keeping simple daily routines or as some would say "chores" is all that is needed. This keeps enough order so we can prepare healthly meals, find clothes to wear and time for each other. Everyone in the household should have jobs that they are expected to do and should be reminded when they forget. We should remind them how important family is to each other and how we should love and respect each other by doing the responsibility they have been given. See the webpage on household for more information. Shabbat Shalom. Praise Yahweh in the highest!! giving Him glory, and fulfilling one of the purposes we were created for. Here is an article I ran across in my search on this topic and I would like to share it with you. Witnessing a magnificent fireworks display, hearing a stunning symphony, or seeing a glorious sunset can evoke a response of praise. But often, it's easier to praise a sunset than the Creator of the sunset. In that same way, the difficulties of life often cloud our vision and keep us from praising God. What can we do to restore a heart-attitude of praise? As the psalmist said, "Let everything that has breath praise the Lord" ( Psalm 150:6). As we praise God, we will discover incredible benefits for our lives. That's because human beings were created by God to praise Him ( Isa. 43:7, Matt. 21:16). Due to man's original sin, however, this relationship was disrupted. Praising God helps restore us to that right relationship, for God actually dwells in the praises of His people ( Psalm 22:3). As we draw near to the Father in praise, He draws near to us ( James 4:8). Praise is also our ultimate destiny. When the Lord Jesus Christ returns again to earth, all creation -- including prideful mankind -- will recognize His glory and praise Him ( Phil. 2:9-11). 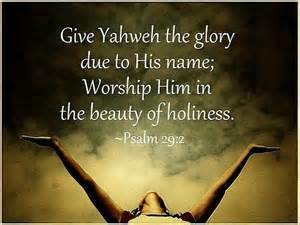 Let's practice to praise Yahweh by making it a part of each day. Now the flesh will rise up against this act but we should push through and this can be done by putting on some wonderful music that helps us in praising Yahweh. PRAISE YAHWEH !! !